There are two photos here. One of them was taken from the cemevi (cem house) in Küçükarmutlu neighborhood in İstanbul on July 19. The last year’s Anti-Imperialist Symposium was held there. Also, before the previous years’ symposiums, political trips to neighborhoods (including Küçükarmutlu) were organized. This year’s symposium will also be held in Küçükarmutlu cemevi. Here, this cem house was raided by police on July 19. Dozens of people were tortured, handcuffed in the back and taken into custody. 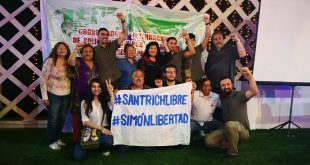 Later, 2 revolutionaries from People’s Front were arressted. Beyond these, what angered us was that, the police urinated in hall of the cemevi. Yes, you didn’t hear us wrong… The police URINATED in the hall of cemevi, which is the place of worship for Alawite people. 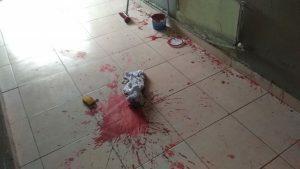 This despicable attack was protested by Alawite organizations in Turkey. They came in Küçükarmutlu and made joint protest statement. Zeynep Yıldırım, chairwoman of Küçükarmutlu cemevi, exposed the assaults of the police to the press. As a result, what happened? One day later, Yıldırım was also taken into custody and arrested. In the second photo, there is a 90 year-old grandma. Today, a resistence is going on inside Küçükarmutlu cemevi by the grandma, Kezban Bektaş (Kezban ana). 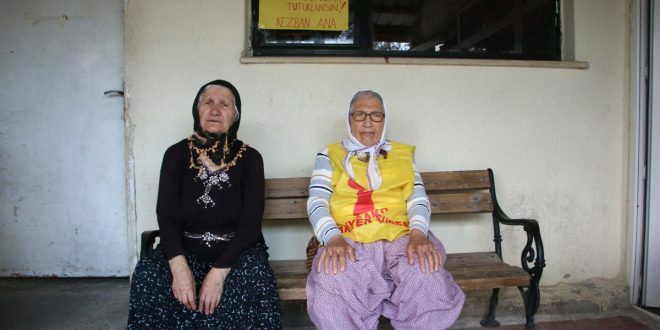 She has been living in Küçükarmutlu for years, and she is also the mother of Zeynep Yıldırım, the chairwoman of cemevi. 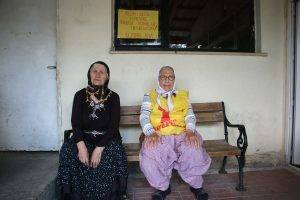 Kezban ana is doing a sit protest every day in cemevi. She is saying that “The ones who urinated inside the cemevi should be arrested, not by daughter”. On this occasion, we invite everyone once again to the 9th Eyup Bas Symposium for Unity of the Peoples Against Imperialist Aggression which will be held on 8-9 September in Küçükarmutlu. We also call to take attitude against the revolting assault in Küçükarmutlu.